Ford and Coca-Cola have teamed up to create an eco-friendly Fusion Energi. It uses recycled plastic and plant fiber fabrics on the seats, head restraints, door panel inserts and headliner. 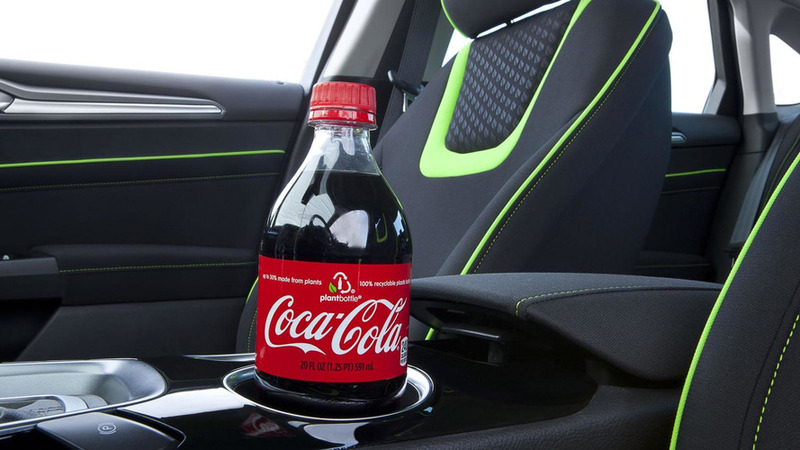 Ford and Coca-Cola have teamed up to create an eco-friendly Fusion Energi. Described as a research vehicle, the Fusion Energi with Coca-Cola PlantBottle Technology has recycled plastic and plant fiber fabrics on the seats, head restraints, door panel inserts and headliner. This doesn't sound terribly exciting but Ford says if they used PlantBottle fabrics on a majority of their U.S. models, it would save the equivalent of 295,000 gallons of gasoline and 6,000 barrels of oil. According to John Viera, Ford's global director of sustainability and vehicle environmental matters, “By using PlantBottle Technology in a plug-in hybrid, Ford and Coca-Cola are showing the broad potential to leverage renewable materials that help replace petroleum and other fossil fuels, reducing the overall environmental impact of future vehicles." The one-off Fusion Energi will be shown at the Los Angeles Auto Show later this month and the PlantBottle fabrics could eventually show up in future production models.